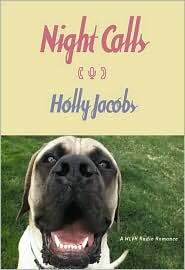 Maybe it was the last book about a dog that made me pull Holly Jacobs' Night Calls off the shelf at the library. Look at the face on the cover. You have to be a little nuts to love that face. And, Jacobs' characters, Cassie Grant and Jonathan Cooper are both a little nuts in this enjoyable romantic comedy. Cassie Grant is the DJ on a radio station in Erie, PA, WLVH. She's on Night Calls, a radio show where she talks about her belief that true love exists, and really matters. Coming from a family where three generations eloped, Cassie expects to do the same with her fiancé, Gene. Instead, when there are glitches in her travel plans, Cassie realizes she doesn't love him, so she dumps him, and resolves to become a spinster, get a dog, and devote herself to her radio career. Ah, that dog. Dudley, an Old English mastiff, is already enormous when Cassie brings the puppy home. And, Dudley falls hard for Cassie's neighbor, Jonathan. Cassie and Jonathan have been friends since the day she moved in, but her broken engagement causes uneasy feelings. It's not quite as easy to be pals when they start to see each other as a man and woman, not just easy-going friends that share dinner and conversation. But, Cassie wants happily-ever-after in her life, and Jonathan, a divorce lawyer, wants an eventual relationship, but doesn't believe in true love. Suddenly, Cassie's life is becoming complicated. "As a woman who had decided to stay single and become a new millennium career woman, she had way too many men on her mind. There was her ex-fiancé who wanted to get re-engaged. Add to that her neighbor who she thought was her friend, but turned out to be a kissing fiend. And then there was Dudley, her slime factory, bed-hogging puppy who sat on people's legs and broke basement doors." And, if her social life doesn't work out, there's always that radio contest at work in which someone can win a date with Cassie. If you haven't discovered Holly Jacobs' romantic comedies, start with Night Calls. If you love romance, humor, and dogs, it might be right up your alley. Night Calls by Holly Jacobs. Thomas Bouregy & Co., ©2006. ISBN 9780803497641 (hardcover), 192p. FTC Full Disclosure - Library book. Love dogs, in romances and mysteries. This sounds good. Am reading a mystery series with a P.I. and her sidekick, a pitbull that is also a therapy dog! Glad you enjoyed the book. I'm a fan of Holly Jacobs' books. They're fun romances, just enjoyable to read. And, Dudley, the dog, was funny in this one. I think I read some of the books in that series. Just blank right now as to the author. Thanks for the lovely review, Lesa! The dog in this book was based on a dog we had a few years back, a giant mastiff. He was the sweetest dog ever. My my youngest was little, she'd tell him to lay down and then wrap herself in his giant legs and take a nap. He wouldn't budge until she woke up. He outweighed her by at least a hundred and fifty pounds! Anyway, thank you! I loved working on this story and was thrilled with the cover Avalon did! It's always a treat to read one of your books, and I know my mother and sisters are fans as well. I just stumbled on this one in the library stacks. Dudley was adorable in this book. I love the story of your youngest sleeping with your mastiff. What a wonderful picture! I haven't read any of Holly Jacobs' books yet, and this sounds like a great one to start with. The cover is too funny - talk about an attention grabber! That cover certainly is an attention grabber. And, if you read Holly's note saying the book was based on one of her dogs, it makes it even better. I hope you enjoy it, Ingrid! I'll be checking this one out..thanks for a great review. Definitely my pleasure to read & review the book, Kris. You're welcome!